How we feel about you and your pet is reflected in the personal interest taken by our staff to best serve our patients and their families. We hope you will come to depend on us as friends who are here to maintain your pet’s health through preventative care and to restore your pet’s health should he or she become sick or injured. We welcome your questions and feel that providing our clients with information is as important to your pet’s well being as any medicine we dispense. We want your experiences at our clinic to exceed your expectations—waiting times should be minimal and service should be friendly and unhurried. Our staff are well educated on the latest in veterinary medicine and we strive to keep standards high. 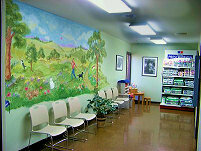 We would like the visit for both you and your pet to be as pleasant as possible and treat your pet as we would our own. Copyright © by Newington Veterinary Clinic. All rights reserved.